I don't notice the brighter screen, but the performance at this price is faster than I remembered. Before I talk you out of reading further, hear me out. 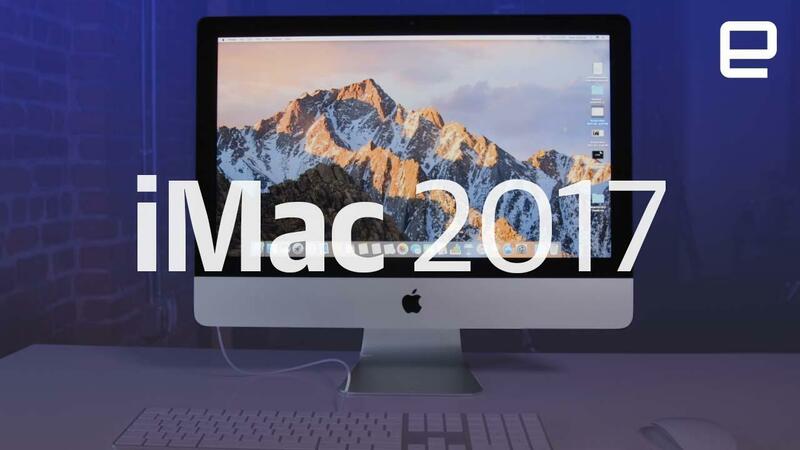 The refreshed iMac does bring some exterior improvements, including a wider Magic Keyboard with a built-in numeric keypad; a second Thunderbolt 3 port; and a display that's 43 percent brighter and supports a billion colors. That's enough for us to take a closer look, even if it doesn't deserve the full review treatment. Speaking of the sort, I'm mostly going to skip over the usual design section. Zeroing in on that upgraded display, I happen to have a 4K iMac on my desk in New York, so to me the bump in brightness is subtle at best, at least if I'm relying on my memory and unable to do a side-by-side comparison today in California. Ditto for the improved color range; the colors here are pleasing and punchy, but weren't they always? That said, a coworker who's not used to iMacs said the brightness was the first thing he noticed -- and it wasn't even yet set to its max of 500 nits. ("I feel like the screen punched me in the face," he said. I'm pretty sure he meant that as a compliment.) In any case, while I might not be able to quantify the difference as "43 percent," I think we can agree that whoever buys this will be pleased by the brightness as well as the vibrant colors. Other than the display and that extra Thunderbolt 3 port, the design remains unchanged. 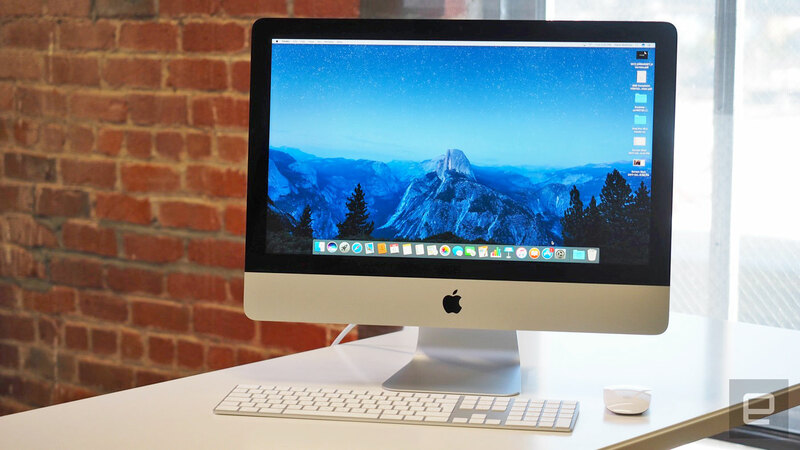 Regardless of whether you choose the 21.5- or 27-inch iMac, they each have the same dimensions as before, with the same unibody aluminum enclosure, the same thin profile and the same pass-through hole for the power cable. The port selection is mostly the same too, save for that extra Thunderbolt 3 socket. 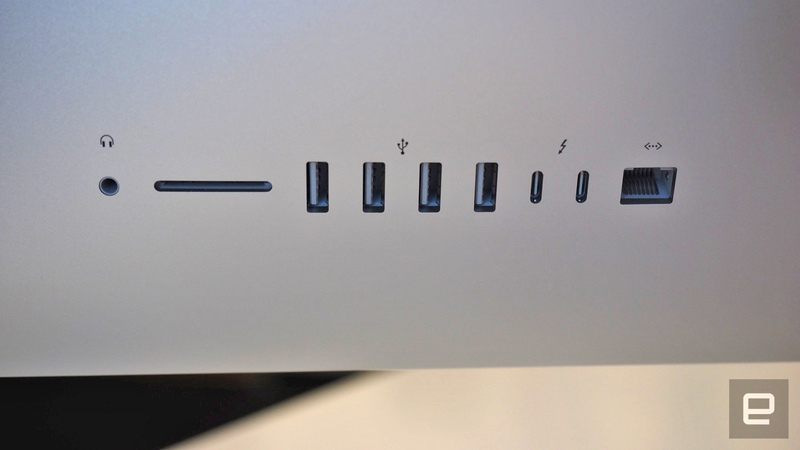 Rounding out the list, you get four USB 3.0 connections, an SDXC card slot, an Ethernet port and a headphone jack. Now, about that keyboard. I'm not sure how clear Apple made this during its keynote Monday, but although you can opt for a larger Magic Keyboard with a numpad, that's not the default option; you have to select it while configuring your order online. Also, it costs $30 over the standard version. (You can buy it separately too for $129.) If you do go with the numpad keyboard, you can expect the built-in battery to last at least a month on a charge, with full recharges taking about two hours. Oh, and if you're worried about the footprint, don't be: It's not that this keyboard is big, it's that the standard one is just unnecessarily small. You will probably have room for it. "I feel like the screen punched me in the face." Like before, the 21.5-inch version starts at $1,099 with a 1,920 x 1,080 display. But now, getting a 4K display will only cost you $200 more, as Apple offers the high-resolution screen in $1,299 and $1,499 configurations. The 5K 27-inch model ranges from $1,799 to $2,299, depending on which model you choose. As for performance, the big thing to keep in mind is the range of specs that are now available. Across the board, both machines pack seventh-generation Intel Core i5 and i7 "Kaby Lake" processors. The RAM here is now of the DDR4 variety, and you can have more of it than before, too: up to 32GB on the 21.5-inch model, and up to 64GB on the 27-incher. The graphics are also said to be up to three times faster, with AMD Radeon 500 series chips in all of the 4K and 5K models. If you buy the 21.5-inch model, you can expect up to 4GB of video memory; on the 27-incher, up to 8GB. Lastly, the solid-state drives are said to be up to 50 percent faster. In particular, Apple's hybrid Fusion Drive is now standard on the 27-inch version, and comes included on the high-end 4K model as well. To me, this feels both overdue and still not enough. Like, come on, guys: Just make flash storage standard across the board, or at least on all machines with a 4K or 5K display. But really, no one deserves the sluggish performance afforded by a 5,400RPM hard drive, especially not in 2017. The unit I tested wasn't the most tricked-out model. This was the top-of-the-line 4K machine (but without any additional upgrades), with a 3.4GHz Core i5 processor, 8GB of RAM and a 4GB Radeon Pro 560 GPU -- a configuration priced at $1,499. That's actually not that different from the older iMac unit I tested, except that one had a 5,400RPM drive, and this one makes use of Apple's hybrid Fusion Drive. For that reason alone, the difference in performance is obvious. Whereas that older machine would frequently hang, or take several minutes to load up my usual programs (Slack, Notes, Chrome, etc.) upon boot-up, this one is much more adept at the basics: launching apps and letting me easily switch between open programs. Will this be all the horsepower you need for things like photography and 4K video editing, though? 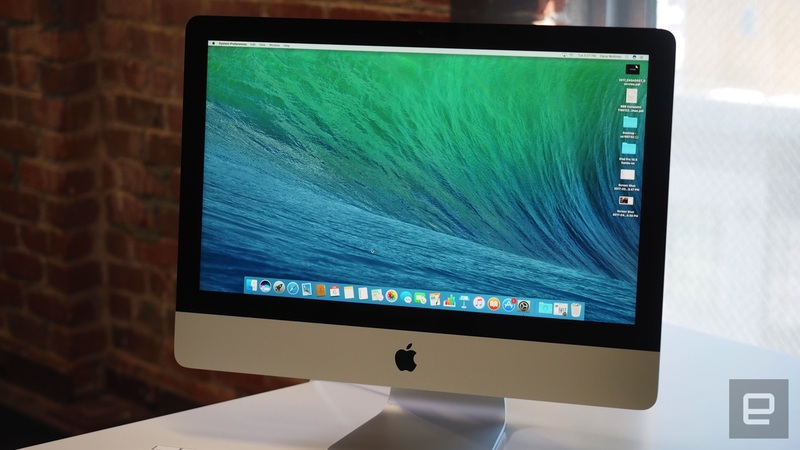 That's all subjective, but to the extent that the iMac, particularly the 27-inch version, has always catered to creative pros, I believe these upgraded machines will keep up -- if not for everyone, then certainly a lot of people. But with the iMac Pro coming out relatively soon, I can understand why well-heeled professionals would prefer to wait and see. Really, it's only mainstream consumers and creative types with more-limited needs (or means) who can safely buy an all-in-one now. But for their purposes, I have no doubt that the iMac offers more generous specs than before for the money.